Smoking tobacco can eventually lead to nicotine addiction. And like any other addiction, the brain begins to recognize nicotine as something it needs. Depriving it of this substance leads to an intense reaction that's often accompanied by a number of undesirable symptoms, including extreme changes in mood. The nicotine found in cigarettes actually affects the way the brain works. Upon inhaling, this alkaloid increases the release of neurotransmitters, such as dopamine, in the reward pathways of the brain, explains the National Institute of Drug Abuse. As dopamine levels rise, you experience pleasure. But repeatedly stimulating these pathways is also known to reinforce behaviors. Over time, the brain acquires a need for the substance to maintain its pleasurable effects, resulting in addiction. While drug levels peak within 10 seconds of inhaling tobacco smoke, the American Heart Association estimates that nicotine from a single cigarette can last up to two hours in the bloodstream. 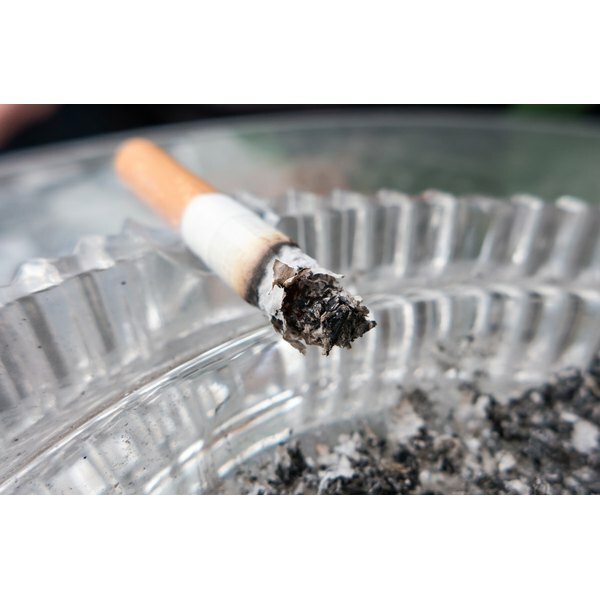 This is compounded by the multiple dosing commonly seen in smokers, leading to the accumulation of nicotine in the blood that may last six to eight hours after your last cigarette. It's for this reason that symptoms of withdrawal can take several hours to manifest in some people. Depriving the body of nicotine lowers the activity of dopamine within the brain, which triggers a craving for the substance. If you fail to supply the body with the alkaloid, you begin to go through withdrawal, sometimes in as little as two hours. It's at this time when you manifest symptoms of withdrawal, such as mood swings. With a mood swing, you may find yourself suddently feeling agitated or impatient. You may become irritable or even irrational. Generally, your reaction isn't appropriate to the situation at hand. Things that wouldn't normally frustrate you become aggravating. Once you supply the body with nicotine, you return the dopamine levels in the brain, leading to a more relaxed or carefree state. The nicotine calms the nerves and makes you feel better. According to the National Institutes of Health, the symptoms of nicotine withdrawal peak two to three days after your last cigarette. After this time, cravings and other symptoms generally lessen and almost completely subside within a few weeks. If you're a heavier smoker, it may take longer to find relief. To help treat nicotine dependence, a number of medications are available. Some actually replace the nicotine, slowly reducing the dose over time, while others minimize the effects of nicotine by altering the neurotransmitters in the brain. Regardless of the type of medication, they all help minimize cravings and other symptoms associated with nicotine withdrawal. Combining any one of these medications with behavioral therapy doubles your chances of quitting, advises the Mayo Clinic.